Convenient enzyme mixture for fast and reliable qPCR using probes, including TaqMan®, Scorpions® and molecular beacon probes. It is the best choice for your probe based Real-Time PCR assays, including singleplex and multiplex gene expression studies, genotyping experiments or diagnostic assays. Compatible with qPCR instruments that don't need ROX dye. The AMPLIFYME Probe Universal Mix is a convenient enzyme mixture for fast and reliable qPCR using probes, including TaqMan®, Scorpions® and molecular beacon probes. It is the best choice for your probe based Real-Time PCR assays, including singleplex and multiplex gene expression studies, genotyping experiments or diagnostic assays. Universal - compatible with all types of qPCR instruments. Additional tubes with low and high concentration of ROX are included. 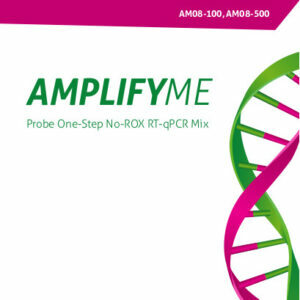 The AMPLIFYME SG No-ROX Mix is a convenient enzyme mixture for fast and reliable quantitative Real-Time PCR, using SG dsDNA-binding dye. Compatible with qPCR instruments that don't need ROX dye. The AMPLIFYME SG Universal Mix is a convenient enzyme mixture for fast and reliable quantitative Real-Time PCR, using SG dsDNA-binding dye. Compatible with all types of qPCR instruments. Additional tubes with low and high concentration of ROX are included.